This 20-something’s business, says Inc., is the second fastest growing in Alabama. 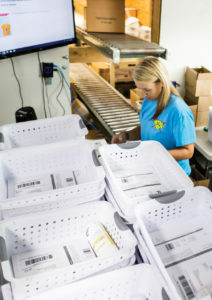 Veterinary Internet ships vet supplies to 38 states and four continents, makes swift adaptations in IT, inventory and marketplaces, and stays a nip ahead of Amazon. If you’ve heard the expression, “Life happens when you’re busy making plans,” the context might not have been a positive one. For Ricky Esneault, when life happened, it was on a fast track for success. As a typical teen, making plans to graduate high school and go to college, Esneault came up with an unconventional part-time job, and it wasn’t long before he was too busy for college. 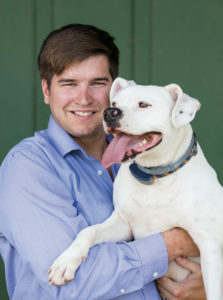 Now CEO of online pet product retailer Veterinary Internet Co. (vetinternetco.com), Esneault looks back at his beginning as an 18-year-old entrepreneur and attributes the fast track in part to timing and in part to an industry eager for options. That’s because online sales and the pet industry were converging in 2009 when he began selling pet flea and tick medications online. He later branched into selling joint supplements for animals, and now runs an internet concern that has expanded beyond over-the-counter pet products to prescriptions and even outside the industry. His largest sales year to date was 2017 with more than $13 million in sales, including $1.3 million in December alone. That level of success has led to his inclusion on the Inc. 500 list of fastest growing private companies in America for two years in a row. His company, located in Union Grove in Marshall County, ranks as the second fastest growing company in Alabama. Beginning with a couple of sales a day of products like Frontline, Advantix and Advantage, Esneault’s view is definitely a 30,000-foot perspective with his “sky’s the limit” philosophy. Ricky Esneault and company mascot Trailer Swift, a pit bull boxer who wandered up. Since that time, the site names have changed as the business has grown from just him and a buddy to today’s two warehouses — a total of 22,000 square feet — and 12 employees, including a pharmacist. Pet prescriptions are treated with the same sensitivity as human behind-the-counter medications. His company currently ships to 38 states, as well as Canada, Europe, Australia and Asia. His key to success mirrors that of other prosperous online companies: reliable shipping, low prices and excellent customer service. According to a survey by the American Pet Products Association, 68 percent of U.S. households are pet owners. That’s 85 million families. Esneault and his wife, Holly, an attorney and in-house counsel for the company, have a host of pets, including three large dogs, so they understand their customers. The company has more than 17,000 pet products and more than 300 brands, as well as its own mascot, a pit bull boxer who wandered up and earned the name Trailer Swift. While timing is partially responsible for his success, strategy has definitely been the key. Esneault recently scored a dot pharmacy site, a difficult feat due to rigorous regulations. The site, vic.pharmacy, is approved by the National Association of Boards of Pharmacy’s .Pharmacy program, which certifies the business as a licensed pharmacy dispensing prescription drugs in full accordance with United States and industry best practices. Esneault has learned to look outside the box over the years, and one result is an inventory management system that keeps the workflow moving. His IT staff spent three years developing a unique inventory accounting system called OKRA that takes into account the company inventory, as well as orders from Walmart, Jet, ebay, Amazon and other online super sellers. The company’s IT staff spent three years developing a unique inventory accounting system called OKRA. With proprietary technology playing a role in positioning VIC to be one of Alabama’s top corporations, Esneault is shifting with trends and enjoying the ride as a 20-something. The company’s success takes the couple to veterinarian conferences and pet supply expos, but one of the most unique perks came this year with an invitation from FedEx to the Kentucky Derby. Because the company ships tremendous volume with the delivery giant, the Esneaults were hosted on Run for the Roses day by FedEx, which also happens to fly racehorses to famous venues. They were also invited to present the trophy at the end of the final race at Churchill Downs that day. It was a natural fit since they also sell supplements for horses, including popular options for thoroughbred horses, from their beautiful Union Grove farm at the foot of the Appalachian Mountains. Moving out of the city to his parents’ farm gave Esneault the ability to grow the company exponentially. That’s one reason he’s no small fry to the big guys like Amazon. In fact, he was invited to one of the company’s strategic account meetings two years ago. They were quizzing him about more than pet products. Esneault said in such meetings, it’s important to protect his interest when a giant like Amazon is always looking at how to compete, especially with its most successful vendors who have clearly found ways to capture lucrative market segments. Maybe it’s the millennial in him, but Esneault is not afraid of pivoting or following the technology trends before they’re even solid. He made his first foray into crypto currency in 2013, and he’s taking a lead in an industry that’s becoming a daily headliner in national financial news. In 2017, he installed his first bitcoin ATM at his mom’s veterinary clinic, Animal Care Clinic in Huntsville. He sold more than 600,000 bitcoin miners last December and anticipates great success in 2018. And while bitcoin seems to be poised for a boom and Bravecto’s three-month flea treatment is flying off the shelves in the pet business, he has another truly hot commodity. “It’s crazy the amount of hot sauce we sell,” Esneault says. “We did about $100,000 last year in Marie Sharp hot sauce. We’re going through a ton of it.” He says his company is a leader in the product among a slew of online marketplaces, including Walmart, eBay and Bass Pro Shops. Naturally, Esneault’s following the market and expanding into that area for the hot sauce aficionados. Using his marketing savvy to bundle and pitch the products, he’s able to fulfill orders promptly enough to keep consumers coming back.